Scottish Ship Management Limited was formed in 1968 as a result of the merger of the shipping staff of H. Hogarth & Sons and Lyle Shipping Co. Unfortunately, in 1986, as part of the demise of the British Merchant Navy, the company ceased to exist. The purpose of the site is to provide a bit of background to the history of SSM and to serve as an archive of material. It is hoped that former officers and crew of the company will come across the site and make contact. Any information and photographs would be gratefully received. H. Hogarth & Sons had been shipowners since 1862 whilst Lyle could trace their origin back to 1798. In 1980 Lyle aquired the 50% of Scottish Ship Management owned by H. Hogarth & Sons, making SSM a wholly owned subsidiary of Lyle Shipping. 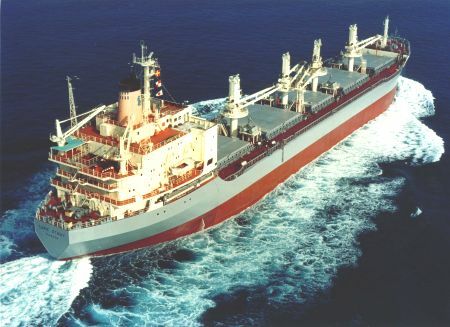 SSM continued to manage the Hogarth fleet as well as that of its parent, Lyle. In its heyday, Scottish Ship Management maintained offices in the U.K., Australia and U.S.A. and employed over 400 people. The two flags shown above are the original house flags of Lyle Shipping Co. and H. Hogarth & Sons.